How did late Stephen Keshi start his career in football? Late Stephen Okechukwu Keshi’s career as a football player was not by coincidence or sheer luck. It was an innate ability and desire to succeed that drove him to such an enviable level in football. As a kid he used to kick every object he came across and that was how he developed strong interest in football. What about his father’s reaction to his interest in the game? I knew Stephen since when he was a 2-year-old when his family was living in Idi-oro, the area between Baba Olosha and Moshalasi in Mushin, Lagos. His father, Pa Aniemeka Keshi took me as a son and was instrumental to my coming to Lagos many years ago. Stephen Keshi’s father was a strict individual and the education of his children was of utmost importance to him. I consider myself as a close member of the family and I also helped to mediate anytime Keshi went against his father’s decision. How did his father react when he won the Principals’ Cup in Lagos? Before he won the Principals’ Cup, Stephen Keshi left home because his father rejected the idea of a football career, but he was adamant and followed his heart. Then, his father stopped to pay his school fees. His mother called me to intervene, which I did, but his father maintained his stance. However, his mother would cook soup, wrap the ‘Eba’ (garri) and hid it inside her headscarf to take to Stephen in his friend’s house. Fortunately, Reverend Father Dennis Joseph Slattery spotted his football talents and gave him scholarship to St. Finabarr’s College. He grew to become a well-known star after winning the Principals’ Cup. Later he was invited into the national team and we started reading his stories in the newspaper. At that point, his father soft-pedaled and started praying for his success in football. Stephen Keshi fought hard by disobeying his father because of a football career that ended up making him the captain of the Nigerian national football team. Can you advise the government on how to immortalise him? I was a member of the committee sent by the council of elders in Illah to welcome Stephen Keshi, when Nigeria won the 2013 African Cup of Nations in South Africa. I was at the airport and also attended some ceremonies held in their honour. The Delta State Government named a stadium after him in Asaba and also promised to build a sports institution in Illah, which would be named after him. This has not been done. What are the changes you expect to see in Illah? I want the Delta State Government to build the sports institution and name it after him as was promised under Dr. Uduaghan and also want the Federal Government to name a befitting edifice after him so that his name would not be forgotten. These are my own opinion and I wish that such would be carried out to honour such a great man as Stephen Keshi was known all over the world. 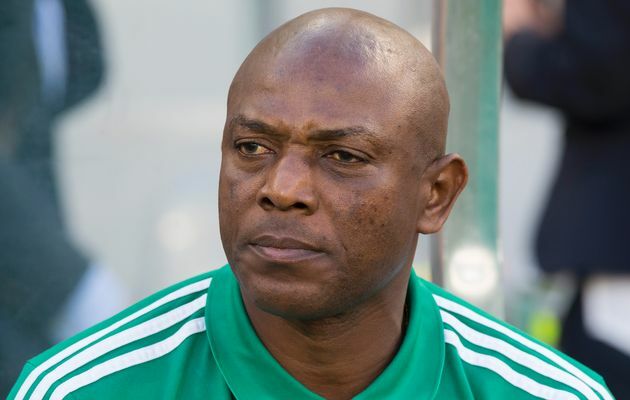 Delta State Governor, Ifeanyi Okowa has described the death of former Super Eagles captain and coach, Stephen Okechukwu Keshi as painful, but urged the family to be consoled that he lived a good life. The governor stated this yesterday, while leading other members of the state’s executive council and other top government officials to Keshi’s residence at Illah, Oshimili North Local Government Area of the state to condole his family. The governor and his team were welcomed by the late Stephen Keshi’s children led by Jennifer, his elder brother, Sylvester Keshi, traditional chiefs, among others. According to the governor: “I am here with members of the state executive council, members of House of Representatives and the state House of Assembly to pay our condolences. I do know that the death of a loved one is very painful. “Stephen Keshi made his mark, not only as a footballer, but as a coach, he lived a good life, but we cannot query God,” Governor Okowa said. adding, “continue to rely on God because, only God can be faithful. “Your father lived a good life and he contributed his quota to the development of Nigeria, he was one of our own,” the governor reiterated, assuring that Stephen Keshi’s name would be immortalised. The soul of former Super Eagles chief coach, Stephen Okechukwu Keshi, will certainly be given a state burial following the revelation that he will be laid to rest in his country home on an over N3 million casket. A very reliable source, who made the disclosure to SportingSun further, revealed that a board member of the Nigeria Football Federation (NFF) procured the casket as part of its contribution towards ensuring that the former Super Eagles captain and coach is given a heroic burial. The remain of the Big Boss as he was fondly known which arrived his home state from Edo State on Thursday on the N3 million casket would be laid to rest in his village in Ila, Delta State. According to our source; “I can tell you on good authority that the football federation has contributed so much on the burial of the last Super Eagles chief coach. For your information, an egghead of the football bought the casket for his burial with over N3 million. “Everything concerning the burial of Keshi is ready and I can assure Nigerians that it is going to be glamorous. As for the football federation, I can conveniently tell you that it has played its own part very well. They will also be participating fully on the burial,” our source said. APPALLED by the paucity of attendance at yesterday’s tribute to the late former head coach of the Super Eagles, Stephen Keshi in Asaba, a member of the House of Representatives, Mrs. Amaechi Mrakpor has urged the Federal Government not to kill the spirit of excellence among the younger generation. Keshi captained the Super Eagles to glory at the African Cup of Nations in Tunisia in 1994 and later won the trophy in South Africa as head coach of the senior national team in 2013, a record that he held with Egyptian legend, Gohary. Despite this contribution to the development of football in the country, the Federal Government was not represented at yesterday’s tribute ceremony in Asaba. The situation probably irked Mrs. Mrakpor who in a tribute said the treatment to the supposed national hero would dampen the spirit of excellence among the younger generation. “We are probably not proud of the country he (Keshi) represented. I just wonder what is going through the minds of the young boys and girls who admired Keshi. I appeal to the those in leadership position not to murder the spirit of excellence in sports, engineering, architecture and other fields of human endeavor in Nigeria,” she fumed. Present at the tribute ceremony were Delta State Governor, Dr. Ifeanyi Okowa who was represented by his deputy, Barr. Kingsley Otuaro, Speaker of the state House of Assembly, Monday Igbuya, President of the Nigeria Football Federation (NFF), Amaju Pinnick, members of the state executive council and members of the state House of Assembly. Also present were some members of the 1994 Super Eagles team including Austin Eguavoen, Peter Rufai, Uche Okechukwu, Alloy Agu, Mutiu Adepoju, Ben Iroha among others. In his tribute, Governor Okowa who read the contributions of the late football icon, said the sports loving people of the state “can never forget Stephen Okechukwu Keshi. We miss you. Earlier, the casket conveying the remains of Keshi arrived venue of the tribute at about 4.21pm from Benin City, Edo State where the final burial rites began with funeral mass, lying-in-state and novelty football match. The burial rites will continue today at his home town, Illah in Oshimili North Local Government Area of Delta State where he will be interred after a funeral mass at the St. John the Evangelist Catholic Church.